So I’ve officially decided that my favorite accessory this season is a fall hat (if you haven’t already noticed ;)! It’s such an easy way to elevate any look, and I love the cool and laid vibe it creates. This one is from ShopSosie and apart from the floppy brim, I’m obsessed with the color! The rich bordeaux is one of my favorite autumn hues and when paired on a hat, I’m totally sold! What is your favorite accessory this season?? thanks to ShopSosie for sponsoring this post. Beautiful outfit for Fall, very chic and laid-back! Love that hat and your shoes! I’m loving the blanket scarf trend this season. I always reach for it when it gets cold. It’s a great color on you! Really love the simplicity of this outfit! Love that you can throw on a heels and can go to an evening with the girls outfit! Super cute Rach! Beautiful burgundy hat! I agree, hats a great way to dress up and add color to a simple fall look! LOVE this look…that hat and those flats are adorable! Love it! Hats have seriously become a problem for me this season. I seriously can’t stop buying them and wearing them! They look great with everything! Love this laid back look for a Saturday morning coffee run! Those vines in the background match almost perfectly! So pretty!! Love those leopard flats! I’ve never been one to wear hats but that one sure does look great! The perfect fall accessory! You look gorgeous! Loving the bordeaux! Such a classic fall color. I just bought a bordeaux CK purse the other day! Totally love this gorgeous color. Love the pop of color from your hat and shoes!! GREAT lip! I have been trying on many at Sephora and think I will go with #31 from YSL since it looks so fab on you! Best lipstick ever right? I have so many shades and just cannot get enough of the consistency — and yes the hat IS the accessory of the moment. You have the cutest hats!! Is there a trick you have to not get hat head when you wear these? Love this simply chic look! The hat and the flats are so pretty! Love the jeans!! Amaaazing outfit! Bordeaux is a good twist on the otherwise classic black, definitely makes the outfit! I love the leopard flats! I’ve been looking for a similar pair for a while now. LOVE this hat! The wine color is perfect for Fall! Pairing it with leopard flats was genius! It gives it a causal yet chic look. My favorite accessory of the season is probably a blanket scarf or a wide-brimmed fedora. Love the chic, laid-back look! I love this hat!! I too have been obsessed with that rich wine/burgundy color for fall. Definitely a guilty repeat offender of the hue. I’m a bit nervous to wear a hat, I’m not sure how well I could pull it off, but it’s on my to-do list of new things to try! The color of that hat is just lovely! Definitely one of my absolute favorite colors for Fall. Great fall outfit! I love the pattern on those flats too! Bordeaux is everything right now! Love love love that hat. I love this look! 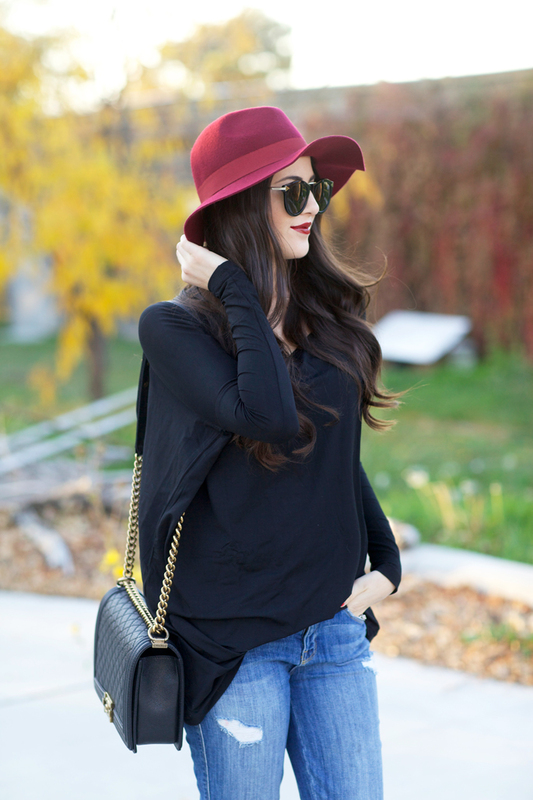 That hat is the perfect fall accessory! I have a similar bordeaux hat I wore on one of my recent posts! Great minds think alike! Would love if you checked out mine! Love the shoes you paired the outfit with. Super cute. That is the perfect fall outfit!!! Ahh, this hat contrasts so well with this outfit. Love this look. Love the printed flats with this colored hat! Great look! Love this mix of lighter wash jeans and black blouse! I am seriously loving this hat! it really is the perfect fall color and such a good color on you. I love it!! I love how you styled this top! You look amazing! Love the flats and the hat! I love hats for fall too! Another favorite fall accessory for me is a scarf. I’ve been wearing scarves with every outfit now. I have a few hats, but most, I love my burgundy Pimkie hat, kisses!! The bordeaux hat looks great with your dark hair Rach! That’s my favourite colour for the colder months too. You look great! Really cute hat and love this casual chic style! Lovely outfit, the burgundy hat is the best! Aaaaah I need that hat! Love it! Great post! I love hats and just purchased one recently. I bought a black fedora style, and I love it! Great to see you posting some casual, but still refined looks lately. As always, you look beautiful. Keep on keeping on girl! Love everything about this outfit! The hat looks amazing! It’s crazy how it can turn around a simple outfit! So cool… Love your pics! This look is beyond perfect!! Especially the Hat!! LOVE!! Great fall look to walk around Philly. You and Drew got so lucky to get great weather. He was in shorts in one of the instagram pictures. AWESOME weather for a great walking city. That bag is awesome! The color of your hat works so well with the black details. This hat is so fab on you and I love that top! Loving those flats paired with that hat! Perfect! I need a hat like that in my wardrobe!!! I’m dying for a fall hat!! You’ve been killing it with fall hats this year and this one is no exception. That color is gorgeous and I love how it makes a statement all alone. Obsessed! Everything looks beautiful ! What is the exact name of your rug? ?